A piercing look at the gulf that separates the Deaf minority from the hearing world, this passionate classic is essential reading for people who want to understand the gap between these two cultures. Critically acclaimed as a breakthrough when first published, the issues brilliantly brought to the fore by The Mask of Benevolence are still deeply relevant. This edition, with new information on the science and ethics of cochlear implants, sheds a forceful light on the mistreatment of the Deaf minority by a hearing establishment that resists understanding and awareness. 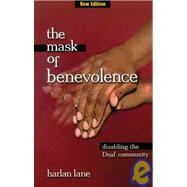 Harlan Lane is recipient of the prestigious MacArthur Fellowship and of the World Federation of the Deaf International Social Merit Award. He is the author of When the Mind Hears: A History of the Deaf, The Wild Boy of Aveyron, and Journey into the Deaf World. He lives in Boston, Massachusetts. Representations of Deaf People: Colonialism, "Audism," and the "Psychology of the Deaf"